Sorry for the unexpected one month hiatus but now I'm officially on holidays I have jumped straight into my long list of projects that I've been putting off, which means more tutorials and updates. yay! So in recent news, I've signed up to the gym with my brother to encourage him to lose weight and you know, to motivate him gawh. Which is actually hilarous because I'm really not one for exercise - I had a gym membership for all of last year, and I went at the start and then it kind of fizzled out along with everyone else's new year's resolutions about exercise and organisation.So this year wasn't much different, I signed up to motivate my brother but he's gunning it and being all gym junkie and shedding weight like nobody's business. But now that I am actually on holidays (post exam day 2) I will have more time to go into the gym since it wont be 5pm finish --> drive in peak hour --> gym at 6pm --> die of starvation of treadmill as I watch cooking shows on the tv --> salivate --> slip on machine and draw unwanted attention to self for falling off a treadmill. Now that I'm going to be going more often, I figure some pretty new gym stuff will make me more motivated, kind of like how a new pen makes you want to write a letter or study or just doodle. Or is that just me? Probably me and all the other asians out there with our inherent pen obsessions. Anyways I figured I would rather make a bag then pay money for a plain black one. Maybe I'll even make a yoga mat bag. But to be honest I don't think I'm near flexy-bendy enough. Seriously these housewives in my class are kicking it - they have feet that can touch their heads and everything. I was getting owned. But one step at a time. So I don't really like dumping my shoes into my bag with my clean clothes or even my sweaty gym clothes because the bottom of my shoes goes all kinds of disgusting places, like bathrooms and dog poo-ey grass. Thus, I've made a foldable shoe bag that can be used to stash runners for the gym or can even be folded into a little shopping bag for emergencies. I've lined the bag with oilcloth so I can wipe out any dirt that might accumulate on the bottom of my shoes and flake off into the bag. The great thing about this foldable shoe bag is how simple it is. Anyways click on link for the tutorial after the jump. So first things first, measure your shoes. I'm an Australian size 6 which is smallish, so best if you measure your shoes to see if they will fit in the dimensions for my bag and if not increase accordingly, otherwise you'll have a midget bag - which is ok if you have small feet or a child who you can pretend you made the bag specially for, but if not measure as below. But with my bag since I chose to use contrasting fabric I added a 1cm seam allowance to the length of my fabrics and calculated for 5cm in contrast fabric. But when I sew the fabric together I had to added ~1cm seam allowance meaning I had to add 2cm to each of my fabrics. Grab the fabric for your big loop and fold in half and iron. Now fold it over again so it is a quarter of its original size. Topstitch both edges of the big loop fabric and put aside. Grab the fabric for your small loop and fold it the same way as before, so it is a quarter of its original size. Fold the small loop into thirds as shown in the picture below and iron flat, you'll probably need some pins to keep it in shape. Grab the 2 pieces of fabric for the outer part of the bag. Place the contrast fabric and the main fabric with good sides facing each other and sew across the top, as shown in the picture on the right. Once sewn and ironed flat it will look like the picture on the left. Place the right sides of the outer fabric together and sew around all three sides. Place the right sides of the inner fabric together and sew around all three sides, remembering to leave a gap in the side to turn through later. Grab the bottom corners of the outer fabric and pinch into a triangle shape as below and pin. Now gather the other corner piece on the other side of the fabric and pinch into a triangle. To make sure you have an even looking bag, line up the second triangle your pinching with the one you've just pinned. Have a look at the second picture - there is actually two corners there and 2 pins, there is a green one on the left and a white one on the right - bad colour choice i know, but squint and you'll get what I mean. Turn it out to check that the side are equal. Turn it back around and clip the corners to reduce bulk. Do this for both the outer and inner fabrics. Line up the outer fabric corners with the inner fabric to get the same size. Grab the small loop fabric from before and pin it to the right side of the inner lining. Grab the big loop fabric and pin it opposite the small loop of fabric, to the inner lining. Place the inner fabric with the wrong sides facing each other (i.e. the right sides facing outwards) inside the outer fabric, with the outer fabric right sides facing each other. Basically something like like below. So the trick with oilcloth or vinyl fabric is to use bulldog clips or pegs to hold the fabric together as pins tend to make marks and its tough to get through. Sew across the top of the bag. Now pull the bag through the hole you left in the lining and it will look weird and screwed up but keep pulling and you'll get there. Align the two sides of the inner fabric where the hole is and sew it flat. With all the sides sewn up, push the inner lining into the outer part of bag and push out the corners. Once you've pushed the lining through it should look like the picture below - tah dah. 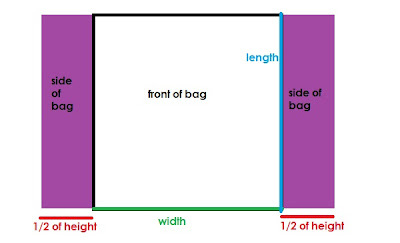 Fold the outer thirds into the middle and roll the bag up, open the big fabric loop and put it around the bag. Handy no? With your shoes in - yours should look less squished since I upped the measurements. Happy crafting and if you have any questions or any versions of my projects I'd love to hear from you. Helpful step by step for such a clever project; thanks for sharing this! The kids need this and me too. Very clever! I didn't read through the list of materials at first so when I got to the pictures where you pulled the bag out through the hole in the lining I was surprised to see that it looked plastic, like a plastic market bag. The I looked back I understood the reasoning; it keeps the bag cleaner and decreases the need for repeated washings should one put muck covered shoes in the bag. Very clever indeed! It's an amazing idea! Your blog is wonderful and I'm already following you! This is a great tutorial! Thanks for sharing. I need some of these. I'll be following you!